The objective of this trust is to provide long term growth in income and capital, principally by investment in UK equities. The Board continues to recognise the importance of dividend income to shareholders. This trust is intended for investors with at least a basic knowledge of markets and experience of shares; that understand the trust’s risks in seeking income and growth from mainly UK companies and are investing for a period of no less than 5 years. This fund charges a total expense ratio of 0.88% per year. The dividends per share have continued to increase over the last 10 years showing strong growth above RPI inflation. The total increase was 77.91% (5.38% annualized). 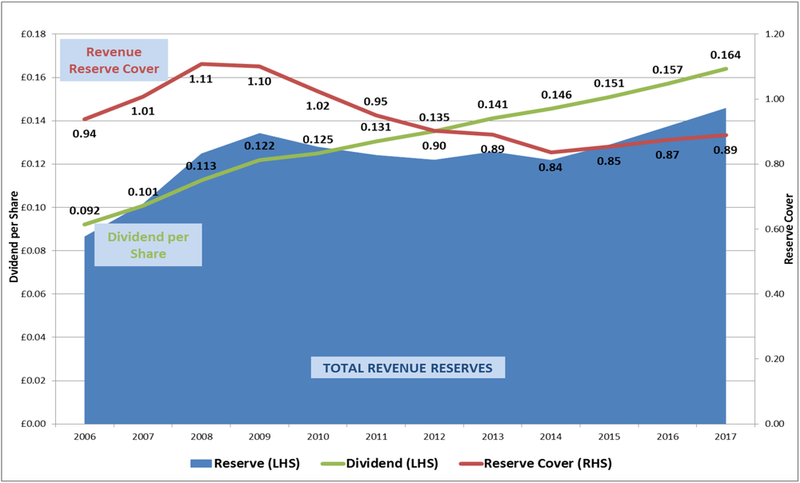 The revenue reserves have not been increased at the same rate as the dividends with an increase of 68.51% (4.86% annualized), which means that the reserve as a percentage of the dividends has reduced, but not significantly. The reserve cover hit a low point of 0.84 in 2014 but has now climbed again to 0.89. The 10 year change in revenue reserves is 4.86% p.a. versus RPI at 1.92% p.a.